The gospel music community lost a legendary giant with the passing of Dr. Rodena Preston Williams on Sept. 15 in Los Angeles. Known throughout the industry as an exceptional pianist, director and arranger, Williams was child prodigy who grew up to work closely with the late Rev. James Cleveland and many other gospel greats. She also organized the award-winning Voices of Deliverance that released five albums in the 1970s. A gospel musical celebrating her life is planned for Thursday, Sept. 28, at 7 p.m., and her homegoing service is scheduled for Friday, Sept. 29, at 11 a.m. The location of both events was pending at press time. 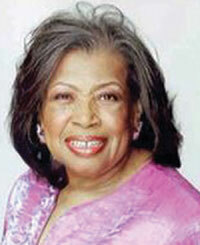 During her long association with Cleveland, she traveled the world as his pianist and close collaborator when he founded the Gospel Music Workshop of America. “I witnessed the birth of this organization and its growth into an international association with 75,000 members,” said Williams, who served decades on the GMWA National Board of Directors and as the organization’s Minister of Music. Throughout her enduring career, Williams maintained a strong relationship with Christ. Reflecting on her faith, she said, “God has always and continues to be number one in my life. His loving power has guided and protected me throughout my career and enabled me to stay firmly grounded in His word whether I’m dealing with challenges, setbacks, or triumphs.